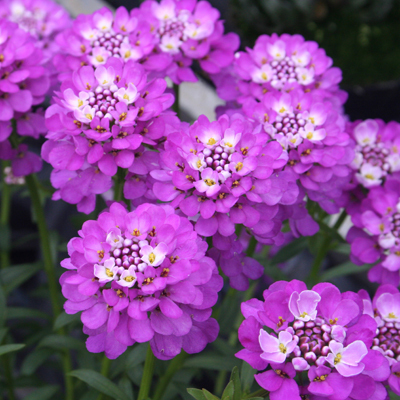 The first Candytuft with mauve/purple flowers, hardy in well drained sunny gardens. A compact, upright, spreading and mounding plant. Compact heads of small flowers in a rounded shape cover the bush in early spring. Use ‘Absolutely Amethyst’ as a border planting, in mixed garden beds, in rockeries and garden pots. Borders and scattered planting throughout the mixed garden beds are real uses. When in flower it will really stand out to all who come by. Larger garden pots and hanging baskets are really superb but make sure they do not dry out between watering. Plant in a sunny positions. Keep the plant lightly clipped to shape after flowering. Apply slow release fertilizer at this time and water well. In full sun the plant really enjoys spring weather. All Iberis whether annuals or perennials are native to Europe, North Africa and parts of Asia. They are named for Iberia, the ancient name for Spain where many of the species are native. By careful selection the breeders at Innovaplant in Germany were able to select the wonderful coloured flowers and deep green plants of ‘Absolutely Amethyst’.